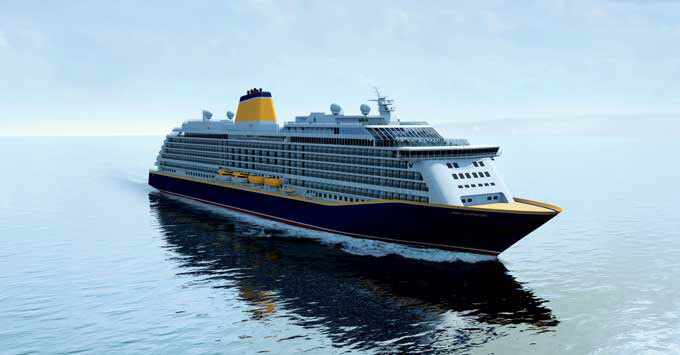 (10:45 a.m. BST) -- Saga Cruises has announced its first new-build ship, Spirit of Discovery, will be all-inclusive from January 2020. It means all house spirits, wine, beer and soft drinks will be included in the cruise price -- as well as tips, transfers and Wi-Fi. Saga confirmed sister ship Spirit of Adventure will also be all-inclusive when it joins the fleet in August 2020. Chief operating office Nigel Blanks said: "The decision to go all-inclusive in 2020 had been made to reaffirm our position as a niche luxury cruise operator. "Spirit of Discovery and Spirit of Adventure are the only boutique small ships being built with the British market in mind. I firmly believe that our decision to move to all-inclusive cruising will ... sit well alongside our boutique cruising proposition." The first of two new 999-passenger ships, Spirit of Discovery will have 540 all-balcony cabins and suites, 100 of which will be specifically designed for solo passengers. Other features include two speciality restaurants, a main dining room and a Britannia Lounge, two swimming pools, a theatre, a library, a spa and a beauty salon. Spirit of Discovery will replace Saga Pearl II in 2019; Spirit of Adventure will replace Saga Sapphire the following year.